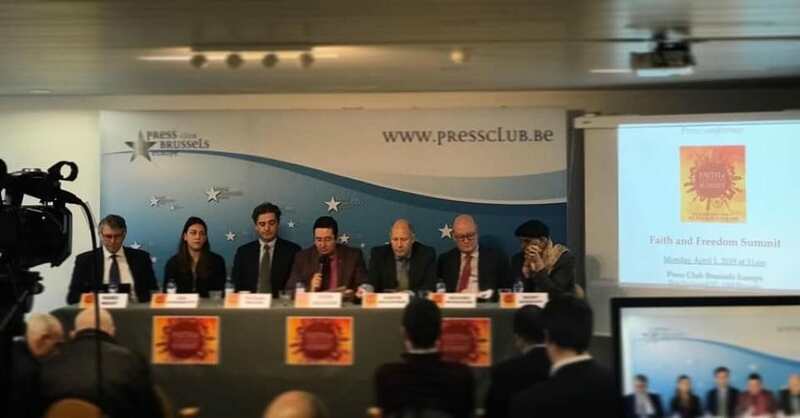 Protests in Paris and a conference at the European Parliament confirm that the voices of CCP’s victims is amplified by coalitions. 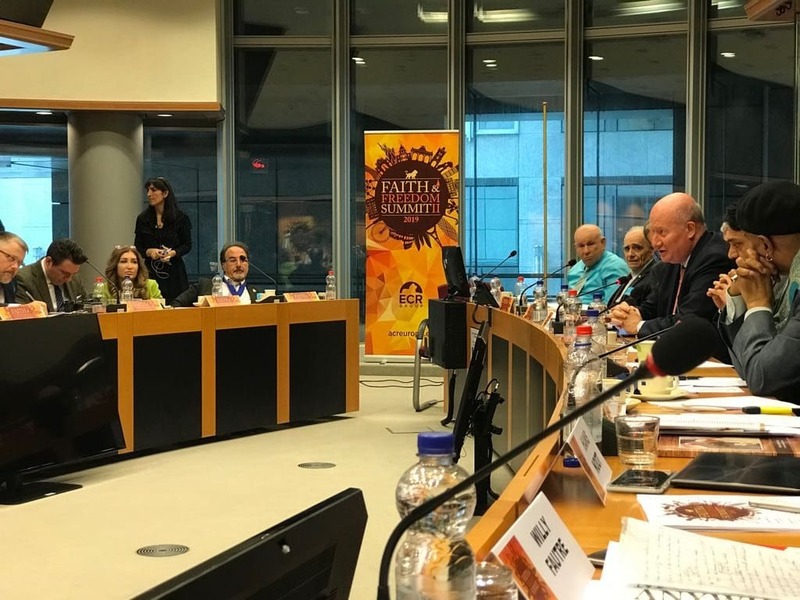 On April 3 in Brussels, following the April 2 Faith and Freedom Summit at the European Parliament, an International Religious Freedom (IRF) Roundtable for Europe was convened. 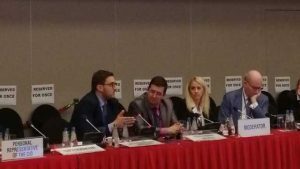 Participants studied the experience of the IRF Roundtables in the United States and elsewhere. One of the fruits of the latter was the Coalition to Advance Religious Freedom in China, introduced on March 4 at a press conference in Washington DC by Sam Brownback, the U.S. Ambassador-at-large for International Religious Freedom. The Coalition includes ChinaAid, the Uyghur Human Rights Project, Citizen Power Initiatives for China, Falun Gong, The Church of Almighty God, and the International Campaign for Tibet. It is a powerful idea. The Coalition’s members have very different theologies. However, by coming together they testify that questions of theology should be separated by questions of human rights. While theological divergences are normal when dealing with religion, it was a powerful message when in Washington DC Tibetan Buddhists were photographed holding pictures of Muslim Uyghurs killed by the CCP, and Uyghurs holding pictures of Tibetans who shared the same fate, while members of The Church of Almighty God and of house churches, who have strong theological differences in China, shared the same podium and delivered the same religious liberty message. One of the speakers at the press conference that introduced Brussels’ Faith and Freedom summit was Bitter Winter’s editor-in-chief, Massimo Introvigne. The summit was about Europe, and Introvigne mentioned the need for European countries to confront China about human rights in bilateral and multilateral meetings, and to adopt a uniform European policy welcoming refugees fleeing religious persecution in China. In the cacophony of modern media, Introvigne said, it is easy for the voice of a single persecuted group to get lost. Coalitions is the name of the game, and experience prove they work. That this is the case, Introvigne told reporters, was proved by the recent visits of Chinese President Xi Jinping in France and Italy. In Italy, a coalition of NGOs promoted by Bitter Winter was instrumental in persuading the media, and some politicians, that human rights cannot be ignored in the name of commerce. 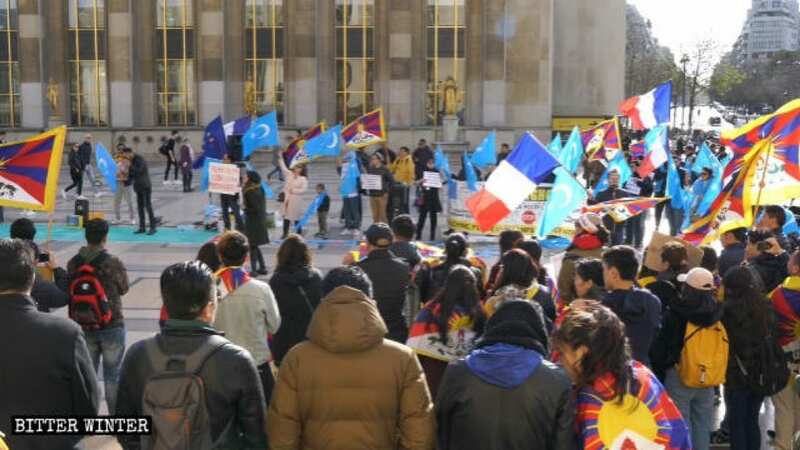 In France, on March 25, upon Xi’s arrival in Paris, Amnesty International, Action des chrétiens pour l’abolition de la torture (ACAT, Action by Christians for the Abolition of Torture), Reporters Without Borders, and other human rights organizations as well as members of The Church of Almighty God (CAG), Uyghurs, Tibetans and others overseas Chinese gathered at Place du Trocadéro in Paris and protested against CCP’s atrocities against members of all religions. In addition, they urged French president Emmanuel Macron to discuss human rights issues in China during his meeting with Xi Jinping. The initiator of the protest was Ms. Marie Holzman, president of Solidarité Chine (China Solidarity). She said in an interview with Radio Free Asia that under Xi Jinping’s rule, the situation of human rights in China is as bad as under Chairman Mao. Persecution of religious figures, ethnic minorities, and dissidents is now as severe as it was during the Cultural Revolution. She believes that, due to economic interests, some European politicians have decided to ignore human rights issues in China. She called it a short-sighted behavior. ACAT’s representative confirmed that, since Xi Jinping took office in 2012, the human rights situation in China has continued to worsen. She said she hopes that France and the United Nations will urge Xi to stop such behavior. She also called on the Chinese government to honor its international commitments, comply with the United Nations Convention against Torture, and put an end to the persecution. She also mentioned that Huang Qi, a terminally-ill citizen journalist and the founder of 64tianwang.com is still being detained. He is at risk to suffer the same fate as Liu Xiaobo (1955-2017), the dissident who died in 2017 after having been arrested and denied access to adequate medical help. 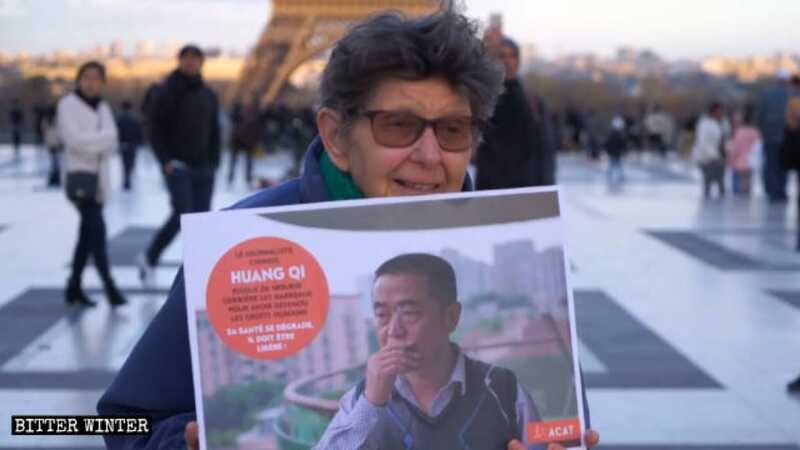 A woman from ACAT is holding a photo of Huang Qi in her hands. Members of The Church of Almighty God, which is being brutally persecuted by the CCP, also appeared at the demonstration. They held up signs reading “Stop Torture,” “Faith Is No Crime,” and so on, shouted slogans, denounced the CCP for its long-term suppression of the CAG, and called on Xi Jinping to stop persecution. 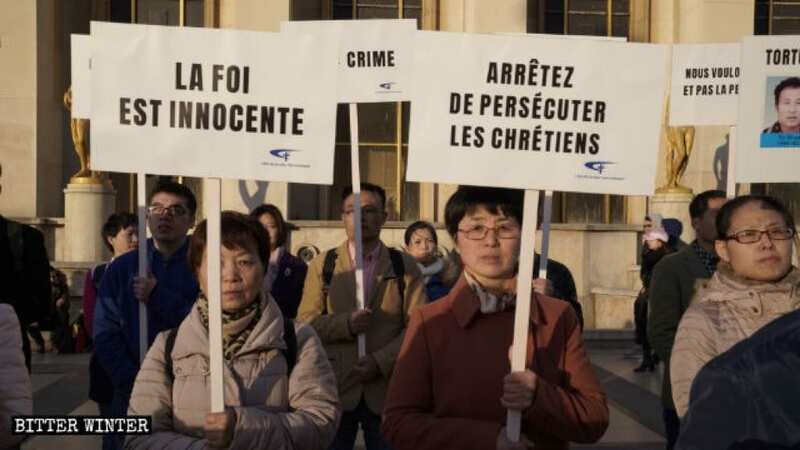 CAG members are demonstrating at Place du Trocadéro in Paris, denouncing the CCP for its long-term persecution of their Church. The Church of Almighty God is the largest and most persecuted Chinese Christian new religious movement. As the Church’s 2018 report on persecution states, nearly 24,000 CAG members have been persecuted in 2018 alone simply because of their religious beliefs and the practice of their faith. 11,111 CAG members have been arrested in 2018, 685 have been cruelly tortured in a variety of ways and have undergone forced indoctrination, and at least 20 have died in the same year while in detention or as a result of persecution. 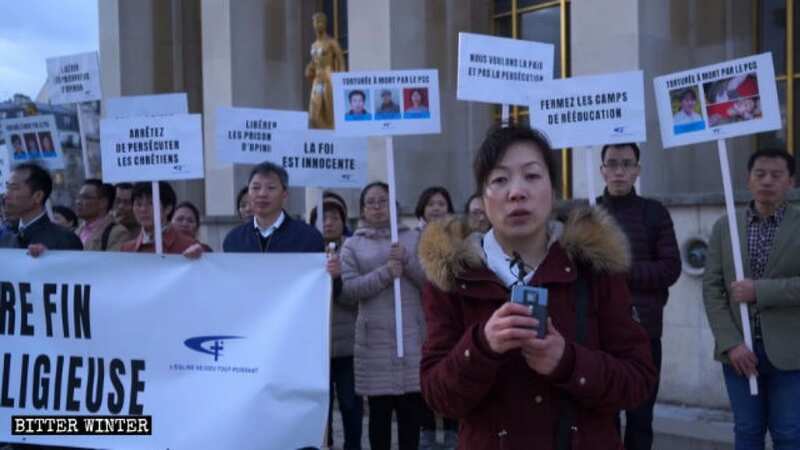 All of the CAG members who protested at the scene fled to France because they were persecuted by the CCP in China. Among them is Feng Aixia from Chengdu, in southwest China’s Sichuan Province. She told Bitter Winter that she was arrested in 2013 while preaching her faith in China. During the interrogation, the police subjected her to brutal torture. One female police officer even stripped off Ms. Feng’s clothes and conducted a forced body search on her. Following her release, she was forced to go into hiding to extricate herself from the CCP’s persecution. In 2015, after enduring a great deal of hardship, she finally fled China. Ms. Feng said that there are many others CAG members like her in France. In total, 444 CAG members have fled to France to escape persecution. 412 applications for asylum were rejected, representing 92 percent of all such applicants. So far, 219 people have received departure orders, and they face the prospect of being repatriated at any time. One CAG member who requested anonymity said that although he is now in France, that does not mean he feels safe. His asylum application has been rejected. Just like when he was in China, he still lives in a state of perpetual fear. 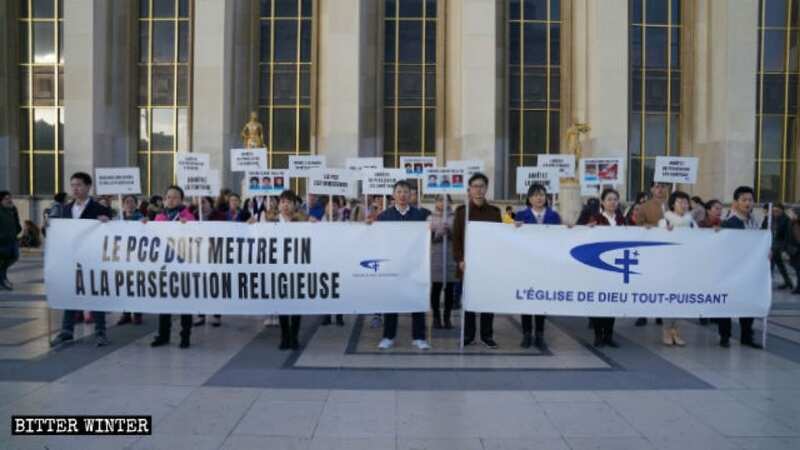 A representative of the NGO Ensemble contre la peine de mort (ECPM, “Together Against the Death Penalty”) said that many Christians in China cannot freely practice their faith, and called it a major human rights issue. He also expressed his concern that China’s expansive foreign policy may lead other countries to follow the Chinese example of restricting religious liberty, while commercial agreements may make democratic countries reluctant to denounce China.